NFL Star Santana Moss' Lighthouse Point Home in Foreclosure | The Law Office of Emil Fleysher, P.A. NFL Star Santana Moss’ Lighthouse Point Home in Foreclosure | The Law Office of Emil Fleysher, P.A. 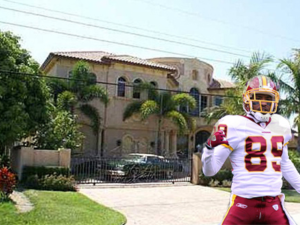 Washington Redskins and former Miami Hurricane wide receiver, Santana Moss, is in foreclosure for not paying the mortgage on his Lighthouse Point home according to Duetsche Bank. He was signed to a three-year $15 million contract with the Redskins in July that also included a $5 million signing bonus. So it is surprising the Deutsche Bank would allege that Moss has gone into default on a mortgage issued for $3.64 million in 2006. Additionally, the IRS filed a $258,017 tax lien in November in Broward County Circuit Court against Moss. With the proceeds of his successful career, Moss bought the 9,304-square-foot home for $5.2 million in 2006. County records show that he maintains his homestead on the property, indicating that it is his primary residence.